I heard an interview on the radio a while back with Sy Montgomery, the author of a book called Birdology. He said that the average chicken can recognize about 100 other chicken faces. Each chicken has a couple of friends that they like. I think 100 chicken faces would be another fun drawing to make. While drawing my friend, above, I realized that she is like a Mary Cassatt aquatint come to life. Her hair, plus the patterns in her clothing. And maybe the meditative mood. This was my first try at drawing chickens. They have kind of a wonderful shape. You almost can’t get it wrong. I took the liberty of making it spring in my drawing, even though it’s not, not at all. You sure can draw the gentleness of a friend and the way she moves and thinks, even while sitting! The chickens are so lovely. I really like this one very much. This is the perfect post for today …. the warmth and glimmer of light that Spring will soon arrive. Your work is so beautiful, really reaches out to touch the soul. Thank you for sharing. I hope you are keeping warm. Wonderful painting of Christ with Chickens. They do have some traits in common. thanks. fun to capture her. Wow as usual. I’m going to share this with my pals who keep chickens (and humanize them). Lovely, really. The chickens must be a nice diversion from the squirrels. 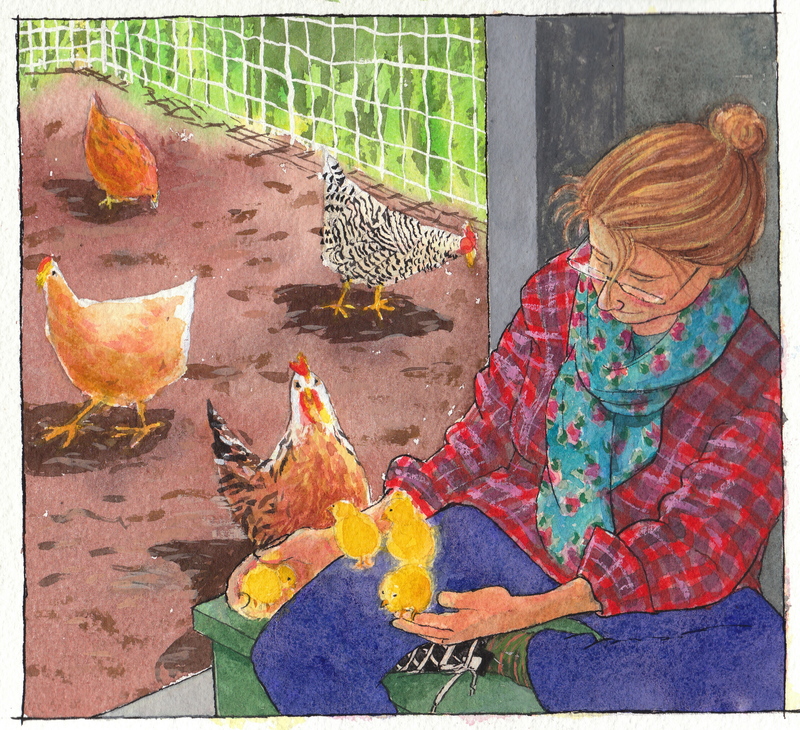 I particularly love the yellow chicks on her lovely blue pants. My eyes went right to it! yes, it was nice to switch gears. Though I don’t want to get TOO far out of my squirrel groove. I love this too. A meditation on a beautiful moment with a wonderful woman. it was really nice to spend a day doing that. very lovely painting. I love how you painted Chris’s hair — the color variation and how some is gently falling in her face — and I love the chicken who’s looking at you. Very sweet description as well. thank you. I hope everyone gets that the sweet words at the beginning are hers, not mine. Thank you, thank you for the chickens!!! happy to present you with some chickens.